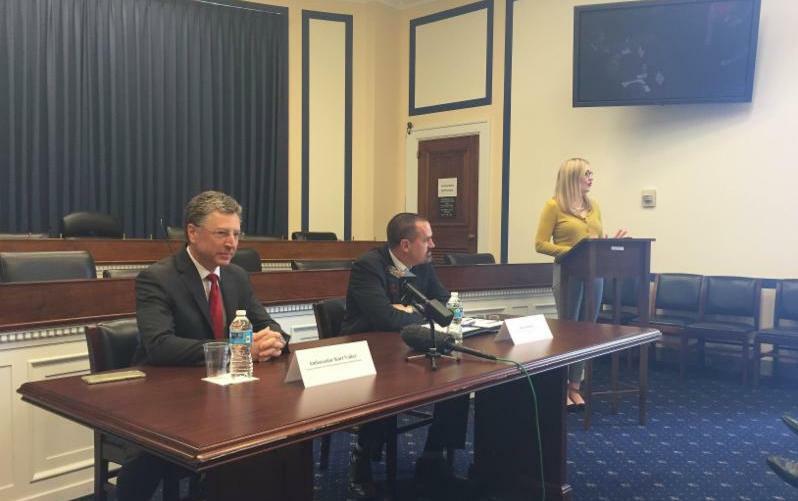 On November 5-6, 2015, the Advisory Council for Bosnia and Herzegovina (ACBH) hosted the fifth annual "Bosnia and Herzegovina Days on Capitol Hill" event in Washington, D.C. This yearly event serves as a way for ACBH to introduce the Bosnian American diaspora leaders and advocates to the Washington D.C. policymaking community and to expand our joint efforts in advocating for a united, multiethnic, and democratic Bosnia and Herzegovina (BiH). 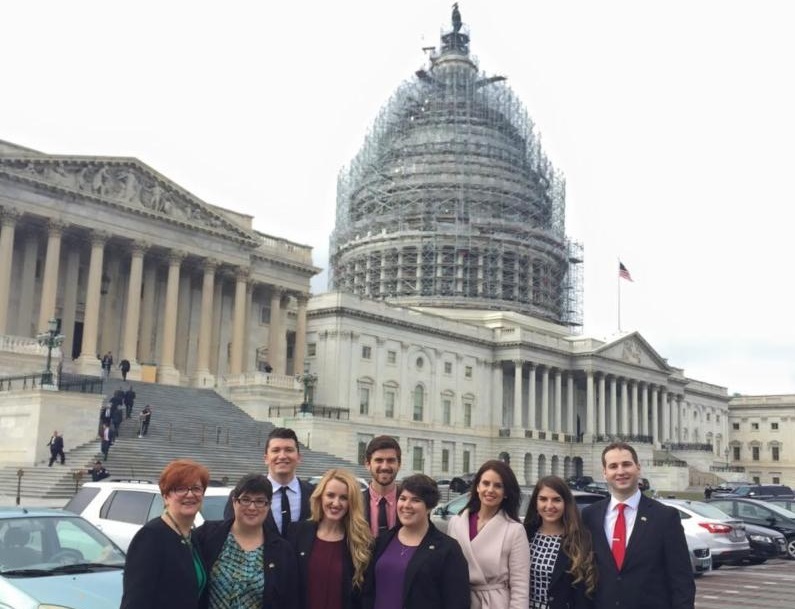 This year's delegation focused on empowering young leaders who participated in numerous high level meetings and attended an ACBH event on Capitol Hill titled: "Dayton Peace Accords: 20 Years Later." Joining the ACBH Board Members, Board of Trustees Members and Executive Director were representatives from Charlotte, NC, Chicago, IL, Los Angeles, CA, Richmond, VA, Alexandria, VA, and the greater Seattle, WA area. The participants began with a breakfast meeting at the ACBH office where ACBH President, Mirzeta Hadzikadic offered opening remarks and informed the delegation of the importance of advocacy in Washington. 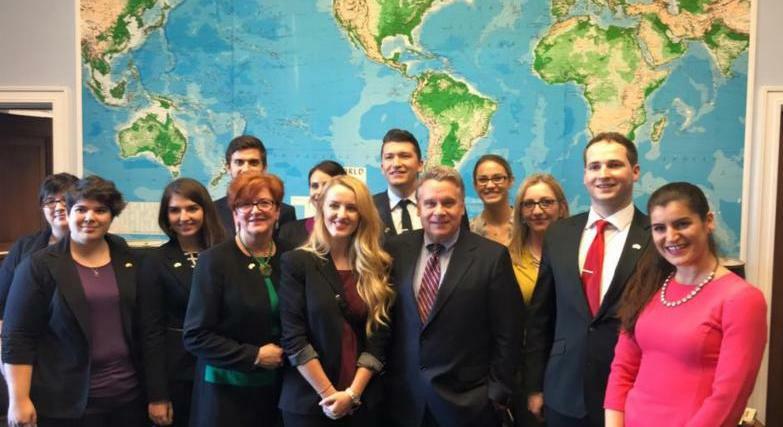 The participants continued their day in U.S. Congress where they met with Congressman Chris Smith (R-NJ), Co-Chair of the Congressional Caucus on Bosnia. The group expressed their gratitude to Congressman Smith for his steadfast support and the Seattle based non-governmental organization Voices of the Bosnian Genocide (VOBG) presented him with an award for his many years of longstanding support. To end the day, the participants met with the Political Director of the National Republican Congressional Committee (NRCC) to learn how the Republican Party focuses on engaging with communities across the U.S. The Bosnian American advocates started the second day in Washington with a meeting at the U.S. Department of State. Sammie Smith, Senior Desk Officer for BiH highlighted the continued U.S. support for BiH's territorial integrity, stability and progress. Next, the group met with the newly appointed Ambassador of BiH to the U.S., His Excellency, Haris Hrle who was pleased to meet young and active leaders. Also joining the delegation was His Excellency, Mr. Adnan Hadrovic, Minister-Counselor at the Embassy of Bosnia and Herzegovina. The delegation discussed the importance of diaspora voting and greater engagement between BiH and the diaspora. After meeting with the Republican Party representatives the previous day, the group met with Alexandra Chalupa, Director of the Office of the Vice Chairs at the National Democratic Committee (DNC). Ms. Chalupa spoke about the importance of diaspora engagement and informed the delegation about the goals of the National Democratic Ethnic Coordinating Council (NDECC). To conclude the two-day program, the delegation met with Mr. Bob Hand, Policy Advisor at the U.S. Helsinki Commission and longstanding friend of BiH who took questions and informed the participants of the various ways the U.S. Congress supported BiH over the years and continues to support BiH. The Bosnia and Herzegovina Days on Capitol Hill event strives to promote BiH and ensure the continued strong relations between the United States and BiH. ACBH commends all the leaders and advocates that participated in the event and looks forward to collaborating and continuing to work together with U.S. policymakers and the Bosnian American communities in order to bring about the necessary reforms in BiH. On Thursday, November 5, 2015, as part of ACBH's yearly event titled "BiH Days on Capitol Hill," young leaders from Seattle, WA representing a non-governmental organization called Voices of the Bosnian Genocide honored Congressman Chris Smith (R-NJ), co-chair of the Congressional Caucus on Bosnia with an award recognizing his efforts to ensure that the genocide at Srebrenica is acknowledged. In a press release issued by the U.S. Helsinki Commission, which is Chaired by Congressman Smith, he stated that: "it is moving to receive this award from young people, many of whom are survivors of the genocide or lost relatives at Srebrenica and are now working to promote human rights. Today the international community is nearly unanimous when it proclaims that the Srebrenica massacre was a genocide, although shockingly, there are those who continue to deny that the policies of aggression and ethnic cleansing implemented by Serb forces meet that criteria." ACBH Board of Trustees Member, Adisada Dudic who is a Srebrenica Genocide survivor thanked Congressman Smith during the meeting, noting that the people of Srebrenica and the people of BiH appreciate his efforts throughout the years, notably for the resolution that Congressman Smith authored in July 2015 which defined the Srebrenica massacre as a genocide and was passed unanimously by the U.S. House of Representatives. ACBH is deeply grateful to Congressman Smith for his leadership and friendship throughout the years and for his continuous efforts in fighting for justice for the people of BiH. On Thursday, November 5, 2015, ACBH with the help of the office of Congresswoman Eddie Bernice Johnson (D-TX), co-chair of the Congressional Caucus on Bosnia marked the 20th anniversary of the Dayton Peace Accords by organizing an event on Capitol Hill titled, "Dayton Peace Accords: 20 Years Later." The distinguished panel included Ambassador Kurt Volker, Executive Director of The McCain Institute for International Leadership and Ian Campbell, Deputy Director at the Office of South Central European Affairs at the U.S. Department of State. While the Dayton Peace Accords ended the ethnic cleansing and genocide in Bosnia and Herzegovina (BiH) it also gave BiH a complex two-entity system of governance - the Federation of BiH and Republika Srpska (RS). Twenty years after the signing of the Dayton Peace Accords, BiH is striving to move forward despite obstacles that were created by the very peace agreement that stopped the war. Ambassador Volker noted that if Bosnia has taught us anything, it is that timely intervention is important and can be categorized as a lesson learned to use in situations like Syria. "While Dayton was necessary at the time, the problem today is that the country is frozen in place. The system rewards corruption, inefficient governance, and is preventing economic investments and preventing Bosnia in moving closer to the EU," stated Ambassador Volker. Mr. Campbell noted that Dayton taught us that transformative power of diplomacy is essential and that the Dayton Accords are an example of it. According to Mr. Campbell, while the peace agreement is not perfect, it create space for participants to work it out. Further, he noted that BiH will not get into the EU if it does not solve the Sejdic-Finci issue and highlighted that anyone playing with idea if breaking up BiH is playing a dangerous game, noting that this tactic is being used to distract from the real issues. ACBH is thankful to the distinguished panelists for their strong stance in support of a united, multi-ethnic and democratic BiH and urges the U.S. government for even stronger support of BiH. Lastly, ACBH urges the people of BiH to hold their elected representatives accountable and demand for more reforms that will usher BiH into the EU and NATO.